If you’re trying to decide on the best flooring your basement, look no further! We’ve created a cheat sheet for you so you can choose the best option for you. The first thing you need to think about is this: what will you be using your basement for the most? What activities will you and your family be doing in the basement? Will it be a playroom and a game room? Or, do you plan on entertaining guests on a regular basis? After asking yourself these questions, you’re a step closer to figuring out what kind of flooring to get. 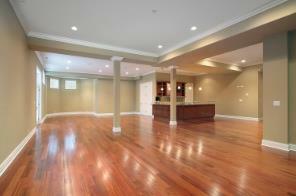 What you need the basement for will ultimately determine the type of flooring you decide to purchase. Let’s take a look at some of the basement flooring options that you can purchase! You’re going to love these great options. Vinyl tile is a very popular choice for basements. It will provide you with a very realistic look whether you want it to appear to be ceramic, stone, or wood. It’s also very easy to clean and is kind to your feet. This kind of tile will be perfect for you if you plan on having a kitchen or a bar in your basement. It will be easy to maintain and to clean up after any messes or spills. It is also very easy to install–it can be installed with or without grout, depending on the look you want. It offers water resistance and comes in many unique patterns that will please the eye. If you plan on doing some entertaining and you want a floor that can handle it, this kind of tile is for you. Engineered hardwood is not the same as solid hardwood. Engineered hardwood flooring is specifically designed to be installed in finished basements. These floors have multi-ply construction which gives them fantastic stability in the long term. It also minimizes concerns about shrinking and expanding with seasonal changes like temperature and humidity. If your basement is going to be used for multiple things, this flooring is probably the best option for you. Engineered hardwood looks just like regular hardwood–it has that rustic, warm, comforting vibe. If you plan on entertaining, but will also use the basement for family space, this flooring will be great for you. Engineered hardwood comes prefinished, so there’s no worry about on-site finishing problems. This flooring is also easy to clean and long-lasting. It can be installed very easily as well, as it does not need to be attached to the subfloor of your basement. If you’re looking for a clean, chic look that’s also durable, then this flooring is for you! You really can’t beat laminate flooring for your basement. Laminate flooring can also be designed with almost any color or texture in mind. So, it might look like you have hardwood flooring or tile to your guests, but really it’s affordable laminate. Laminate flooring is also very easy to clean and extremely moisture resistant. It is very easy to install as it can be installed by a professional without being attached to the subfloor of your basement. Again, if you intend to do some entertaining but also want to use your basement as a family space, then this flooring is for you. With a classy look and easy clean-up, what could be better? It’s also terrific in bathrooms, if you have a bathroom in your basement as well. If you want something that’s more natural, linoleum will meet your needs. This type of flooring is made from materials like linseed oil, recycled wood flour, and limestone. It comes in vivid color choices, resists stains, and is very long-lasting. On average, linoleum can last for up to three decades. Linoleum is fantastic if you want to entertain guests, but also want to use your basement as relaxing space. This type of flooring will make your basement look fancy, but also can also be dressed down to have a casual look as well. Installing carpet into your basement is never a bad idea. Carpet is great if you have kids and you want protective flooring for them to play on. It also comes in a wide array of colors and will look attractive in any area. The only downfall of carpeting is the strain factor. Stains can be difficult to remove from carpeting, so you have to be careful. However, the pros defeat the cons when it comes to carpeting. Carpet flooring will keep your basement warm and cozy in the cold winter months when you just want to curl up on the couch and read a book. And again, if you have kids, this flooring is the one for you.